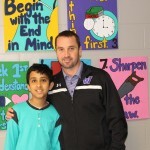 Brookview fifth grader Arun Dixit qualified to compete in the State National Geographic Bee on April 1 at the University of Northern Iowa. Only the top 100 students from each state and D.C. in grades 4-8 advanced to the State competition. To advance to the State competition Dixit had to complete the online State qualifying test at school by February 5, 2016. Dixit worked with a geography coach and spent about 30 minutes a day studying a world map and answering practice quiz questions. The National Geographic Bee is designed to encourage teachers to include geography in their classrooms, spark student interest in the subject and increase public awareness about geography. Dixit’s love for geography has not only helped him in competitions, but also in his social interactions and school work. “I think it is very important to be knowledgeable about the world. It helps you understand the people around you more. I have always loved geography, but now it has become a hobby that I plan to continue,” Dixit said. Each State Bee champion will receive $100, the National Geographic book “The National Parks: An Illustrated History,” a medal and will journey to Washington, D.C. to represent his or her state in the National Geographic Bee Championship at National Geographic headquarters May 23-25. The National Geographic Bee winner receives a $50,000 scholarship, a lifetime subscription to National Geographic magazine, a Galápagos trip and $500 cash. The 2nd place winner receives a $25,000 scholarship and $500 cash. The 3rd place winner receives a $10,000 scholarship and $500 cash. The 4th-10th place winners receive $500 cash each. Everyone can test their geography knowledge with the exciting GeoBee Challenge, an online geography quiz at www.nationalgeographic.com/geobee that poses 10 new questions per day.